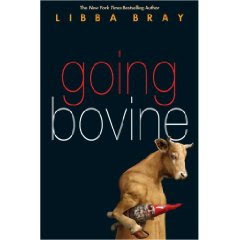 Going Bovine by Libba Bray. Random House. September 2009. Reviewed from ARC supplied by publisher. The Plot: Sixteen year old Cameron Smith is just another slacker at his Texas high school. Until he gets diagnosed with Creutzfeldt–Jakob disease (aka mad cow disease), starts seeing angels, and ends up on a road trip to DisneyWorld with a dwarf, a yard gnome, and an angel. The Good: This is so different from Libba Bray's other books -- I love when an author can do multiple things well. I don't see anything in Cameron's voice that reminds me of Gemma Doyle ; the world in Going Bovine so different -- it's a joy to discover just how multi-talented Bray is, because all you can think is "Holy Hannah, what is she going to do next?" There's some things I think I don't like in books. Then, what happens, is a book comes along that has the things I don't like and I realize it's not that I don't like something -- I don't like it when it isn't done well. Why, I wondered, do I want to go on a road trip with Cameron? And a dwarf? And yard gnome? This is just getting ridiculous. I don't do ridiculous. But then, I remember, I do. I love The Hitchhiker's Guide to the Galaxy . Thursday Next delights me. Like Douglas Adams and Jasper Fforde, Bray throws out casual one-liners that are just fantastic; the book is so full of wry observances and over-the-top humor that I'm sure I missed half of what was there. This book demands a reread. And a reread is needed not just for the humor; but also for the layered storytelling. Flat out the back of the book says, "Hope arrives in the winged form of Dulcie, a loopy punk angel/possible hallucination with a bad sugar habit." If I told you the movies this reminded me of, I'd be giving spoilers. Which is why suddenly, instead of writing a long review, I'm coming up short. Because the joy of all 480 pages is not just Cameron's discoveries, but the reader's discoveries. And I'm not going to take that away from you. Bray addresses serious questions -- about life, and belief, and what it means to live. Why does Cameron need the threat of death to wake him from his life? Do we live to our fullest? Much like Lamb: The Gospel According to Biff, Christ's Childhood Pal and Dogma , something that may be viewed as blasphemous actually asks the most serious of questions. Hey, did I mention there are also Norse gods? Physics? Inuit Rock Stars? Music? New Orleans? All-U-Can-Eat Freedom Pancake Towers? Bowling? Smoothies? Not only is this going on my favorite books list for this year; but I predict this being on starred/best of year lists. Also, this needs to be crossmarketed to adults, who will eat it up. I wondered what Libba Bray was going to do next. I wondered if Gemma Doyle was all she had in her. I'm glad it wasn't - this sounds like fun! I saw Libba Bray at a signing a few years back and she described the plot of her new book - and I kept waiting for her to say, "just kidding!" I glaze over when I see it mentioned. I don't know if I can get past that - but then you tell me it's good, and of course I believe you. Does this mean I have to stop glazing over and start paying attention? I didn't know if I was ready for the ride either, and ended up so glad that I went there and she went there. I adore Dulcie, and Cameron is such a real character. It made me think again and again, "How did she do that?" I love this book. If it were legal, I'd marry it. Throw out age labels; teens and adults will equally enjoy it. One fear is that humor & belief tend not to be looked at as seriously when it comes to award time, and this should be on shortlists right and left. That said, Jess, I totally know what you mean. The plot synopsis did not turn me on; but let me tell you, Bray's writing, characterization, plotting deliver. The only problem I have is that other publishers will see this genius and not realize it's Bray's Storytelling and in 2 years we'll see rip offs of a much inferior quality. While some kids are going to be up for the "zany adventures" label, others (um, me?) find that an "uh, not interested." While Bray delivers on the zany so those readers won't be disappointed, she also delivers to readers like me with her characterization and plotting. You won't regret reading this book. When I first heard about this book, it really did nothing for me. I went to a book signing a few months back and Bray read the first chapter and I couldn't stop laughing. It was so good and I can't wait to read it. Your review is right on! I'm a Bray virgin. I'd heard of her other series, but this book has sounded so much more interesting. The title and cover is what got me. I hope I get it soon. This is my first visit to your blog. Didn't catch that Buffy quote at first. I'll be sure to return. Okay you caught me when you said it has wonderfully witty one-liners. I need to read this one too. Take the Knife? Don't Take the Knife? Did You See that EW Article? I've Got a Barn, Let's Put On a Show!